The city of Manila is the cosmopolitan capital of the Philippines located in the west coast of the island of Luzon. It is gateway to the many islands and tourist destinations north and south of the Philippines. Metro Manila has its own share of attractions to suit every interest. Popular attractions include Malacanang Palace , official residence of the Philippine heads of state; Rizal Park , Paco Park or Intramuros the old walled city, Quiapo and Chinatown for a dash of local color. For more outdoor fun and entertainment, there are sunset cruises around Manila Bay and open-air cultural events held Friday evenings at Paco Park, Saturday evenings at Puerta Real in Intramuros and Sunday afternoons at Rizal Park. Visitors can also explore the museums of the Cultural Center of the Philippines located along Roxas Boulevard. Port Location – The port of Manila is located in Manila Bay. It is situated in the downtown area of the city, close to the major shopping area. Travel Links – Manila is an international gateway city. The Ninoy Aquino International Airport, seven kilometers from the city center, services 26 major international airlines as well as charter flights from Japan, Hong Kong, Taiwan and other countries. 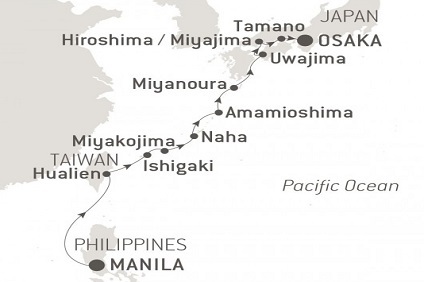 12 Night cruise departing from Manila to Osaka onboard Le Laperouse.